The atmosphere of absurdity surrounding the evangelical Green family, their Hobby Lobby business empire, the new Washington-based Museum of the Bible and the repatriation of thousands of stolen Iraqi antiquities seems proof positive that Karl Marx was correct. History does repeats itself, only this time tragedy and farce seem to be sharing the same stage. 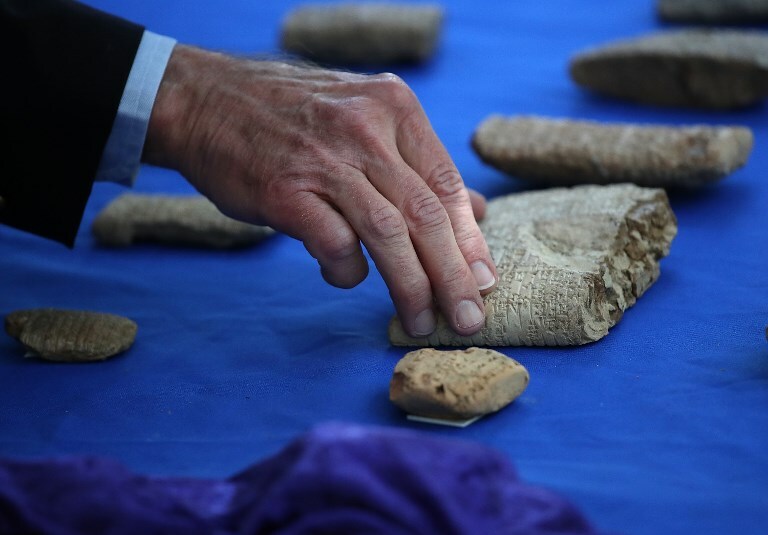 In May, during a press conference held at the Iraqi embassy in Washington, it was announced that 3,800 of the 5,500 ancient Mesopotamian artefacts purchased in 2010 by the Green-owned arts-and-crafts retailer are now to be returned to Iraq. The move reverses a sophisticated black-market operation that saw the pieces smuggled from Iraq via Israel and the UAE to the US, where their US$1.6 million purchase was given the green light by the Hobby Lobby president and Museum of the Bible chairman, Steve Green, against the advice of his own cultural consultants. The objects included bronze age cuneiform tablets, clay seal impressions or bullae, and a pair of cylinder seals featuring royal inscriptions from the mid-third millennium BC. The tragedy is that the 5,500 objects obtained by Hobby Lobby represent only the summit of an immense mountain of objects that have been disseminated, dismembered, defaced or even destroyed in the chaos that followed the US invasion of Iraq in 2003 and the iconoclastic ravages of ISIS. Even without the incalculable losses that have been plundered from previously undiscovered and unrecorded Iraqi archaeological sites, 8,000 objects are still missing from the most likely home of the repatriated Hobby Lobby objects – the National Museum in Baghdad – and the question of how the country can navigate such a cultural cataclysm is yet to be fathomed. When added to the treasures lost to Iraq throughout the 19th and early 20th centuries and which now form such a core part of institutions such as the British Museum in London and the Pergamon Museum in Berlin, the result is a material culture which exists only as a diaspora that may never be reconstituted. The issue is important because it extends far beyond the world of archaeology and museums. In a country riven by ethnic, religious and sectarian tensions, a shared sense of history and heritage is one of the few tentpoles around which it is hoped a new national conversation might start to be constructed, which is why projects such as the British Museum’s recent conservation of a 4,000-year-old Sumerian bridge at Tello in southern Iraq has been lauded as a symbol of the nation’s emergence following decades of war. While such efforts are to celebrated, the conversation about Iraq’s patrimony often ignores the fact that a long-suffering and hard-bitten sense of tragedy and pessimism are central to what might be described as the Mesopotamian sense of self and have been since the bronze age. For history’s earliest city dwellers, civilization was a duality that combined the luxuries and continuities afforded by urban life: justice and poetry, law and music, fashion and kingship with the “kindling of strife” and “the setting up of lamentation,” with fear and war, pity and terror. All this was civilization explained Enki, the Mesopotamian god of wisdom, in an early Sumerian foundation story that echoes the later myth of Pandora’s box. That sense of something that cannot be reclaimed and of a loss from which there is no recovery is most eloquently expressed in the modern Iraqi artefact that is currently on display in London, one of the global hubs for the trade in Mesopotamian antiquities, legal or otherwise. Since the end of March, a brightly-colored winged bull with an inscrutable human face has occupied the Fourth Plinth in Trafalgar Square. The ancient Assyrian original, which once guarded Nineveh’s Nergal Gate, was destroyed by ISIS in 2015. But unlike other recent attempts to reconstruct Iraq’s heritage, this bull makes no attempt at verisimilitude. Constructed from 10,500 Iraqi date syrup cans, the sculpture, called “The Invisible Enemy Should Not Exist,” is the work of Michael Rakowitz, an American artist and activist of Iraqi Jewish descent who has dedicated himself to reconstructing artefacts that are still missing from Iraq’s National Museum using nothing more than food wrappers and detritus. Rakowitz has described his sculpture as a ghost of the original and as a placeholder for the human lives that cannot be reconstructed. In doing so Rakowitz recognizes that Iraq’s fragmentation cannot be fixed and that such destruction – meted out as much by archaeologists and liberators as by iconoclasts and conquerors – is a tragedy that has to be accommodated. Nick Leech is a writer and qualified landscape architect who specializes in the art, architecture and heritage of the Gulf and wider Middle East.